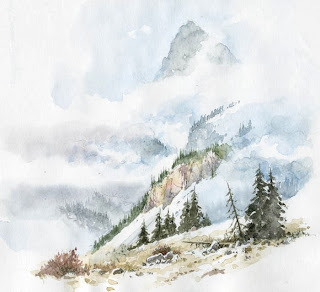 The first snowfall of the winter arrived last Wednesday, and with glorious sunshine slanting across the landscape I abandoned all work and set off up into the hills. Familiar scenes lay transformed into jewels sparkling in the light. At one point I had a sudden urge to seek out a view at a point I had never stood before, a sort of premonition that I might find something exciting there. It was not far off the path, but about 200 yards across rough dead bracken covered in deep snow – ideal terrain to trip over and get a nice refreshing snow-bath. When I reached the point there was no wonderful view, but as I turned back the scene before me really caught my imagination. It was a familiar abandoned house, but from a totally new angle, the whole image enhanced by the deep snow. It certainly brought it home to me that you can often find amazing new scenes simply by approaching the subject from a slightly different viewpoint. 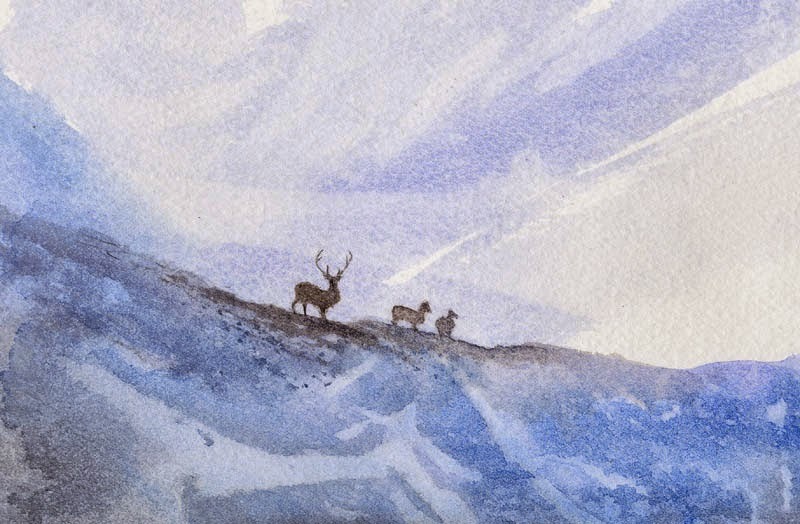 One technique I sometimes use, mainly for foregrounds is that of covering an extremely wet wash with plastic food wrap, as I did here in the watercolour of highland deer that I came across in Glen Affric. In this instance I used Winsor blue, in places mixed with a touch of cadmium red, and varying the wash so that in places there was less strength in the colour, and even parts without any colour at all. You need to leave the food wrap in place until the wash dries completely. 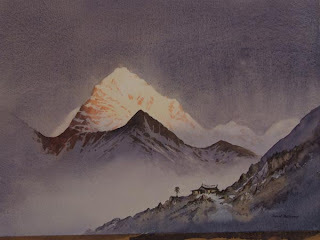 The method gives a spontaneous feel to the finished work. Experiment with various colours. It’s great fun to try this without any preliminary pencil work – you can do several examples at once – and when the work has dried you can see the optimum position to place your drawing before doing any further painting, and thus taking optimum opportunity of how the effect has developed. 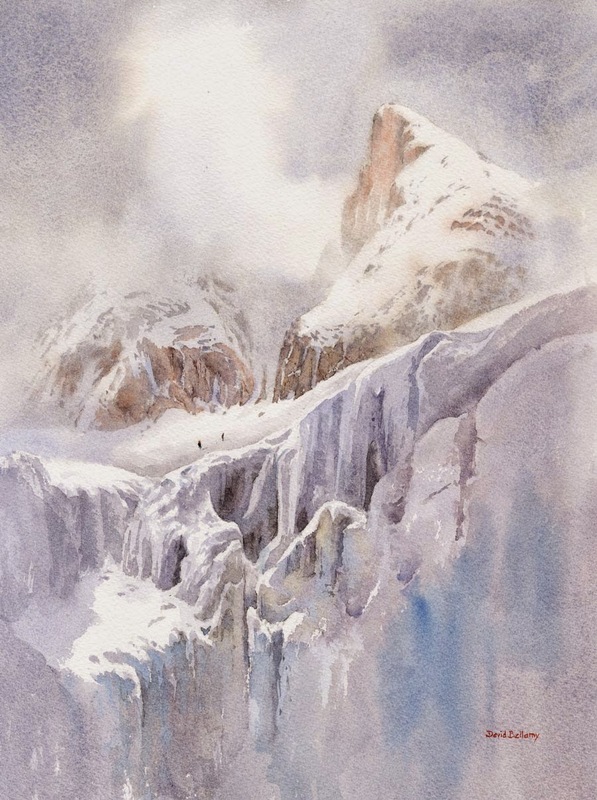 This painting appears in my Winter Landscapes in Watercolour book and DVD, which you should find especially useful if you enjoy painting snow scenery. 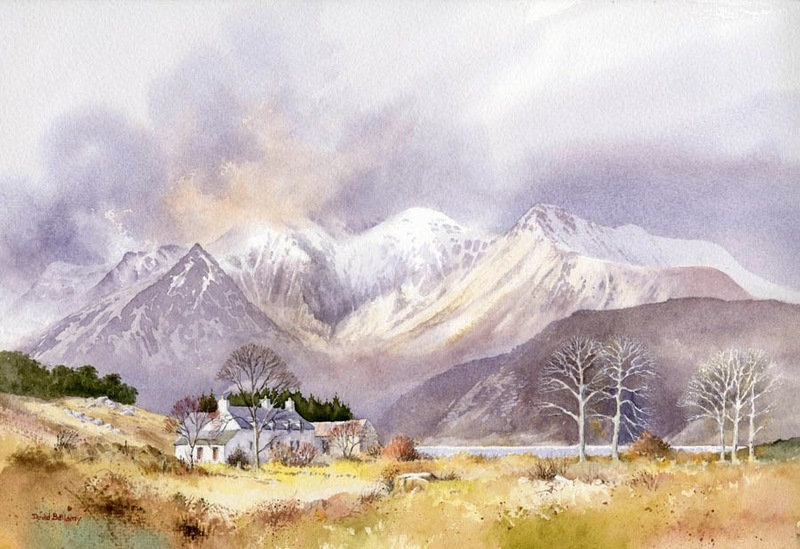 It is crammed with tips on how to bring sunshine into your paintings, creating misty effects wet in wet, transforming a scene by altering tonal effects, making the most of warm colours in winter, and much more. If you wrap up well, use a thin pair of gloves and carry one of those vacuum cups with warm coffee, you can make the most of a snow scene caught in the lovely low sunlight of a calm winter’s day. Leave the food wrap for the studio though!